Color is an important part of our daily lives, particularly if your livelihood depends upon your ability to use color effectively. One out of 255 women and one out of 12 men have some form of color vision deficiency. Most older eyes experience vision deterioration of some sort. Take care of your eyes by resting them throughout the day. If you work in front of a computer screen, remember to take a break every 30 minutes or so by focusing on something in the distance for at least 30 seconds. caffeine and nicotine contribute to computer eye syndrome (blurry vision later in the day) so try to avoid these substances. If this is difficult, mitigate their damaging effects with vitamin c supplements. 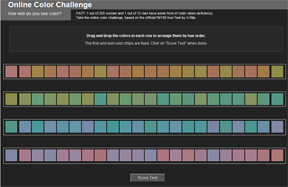 The following test scores your ability to distinguish color values. Those working with color as part of their careers, such as artists or designers, will usually score below 20 (0 is a perfect score). Age is a factor. After 30, distinguishing between shades becomes more difficult. If you score above a 20, take care when working with color by rechecking your choices, especially when color values are similar.